We turned right down Donhwamun-ro, and came across this pile of Roadwork signs, quite different to the ones used in the UK. 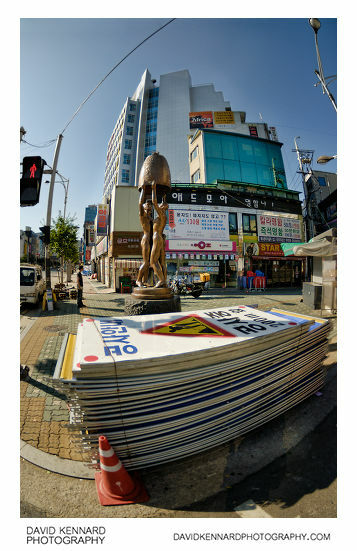 There was also this statue of a naked couple holding what looks like a bell above their heads behind the pile of signs. Despite my best efforts, I haven't been able to find out what this statue is meant to represent or what it was built to commemorate. 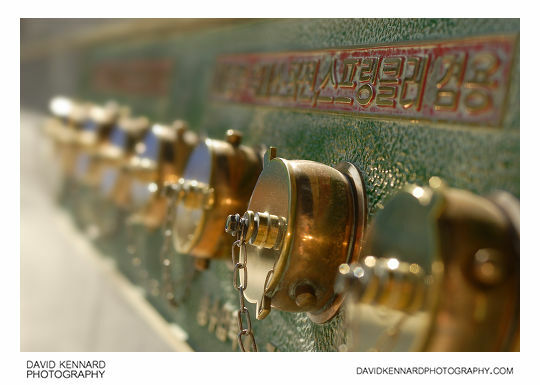 This photo above and the one below are the photos where I discovered upon processing them, that I'd shot them wide open, resulting in (still good, but) less than optimal image quality. 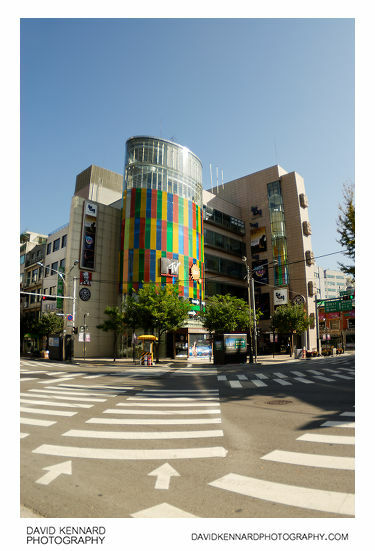 Across the road from the statue and pile of roadwork signs was the Myeongbo Cinema (above), which has large MTV and Nick signs attached to the outside of it. I don't know how these TV channels relate to the cinema. Still in the same area, just behind the statue of the couple holding the bell, there was this small area at the side of a building with a canopy over it. 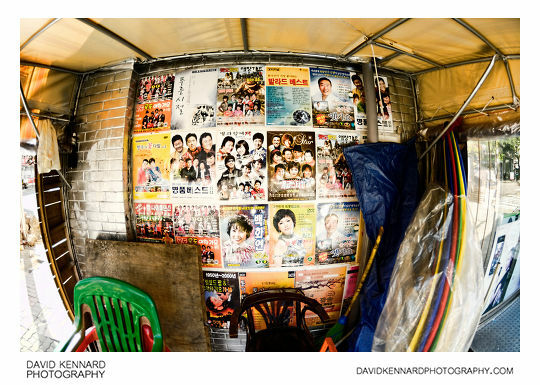 The back wall was covered with various Korean posters, and there were a couple of seats underneath it. Not sure what this little area was meant to be used for. Here's another modified motorbike designed for transporting in goods, in this case old cardboard boxes it seems. A bit further on we came across this large glass building, which is the Chungmuro Tower. 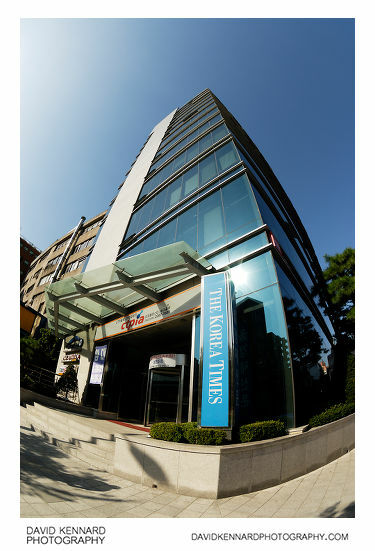 It is home to various businesses, including the Korea Times on the eighth floor. 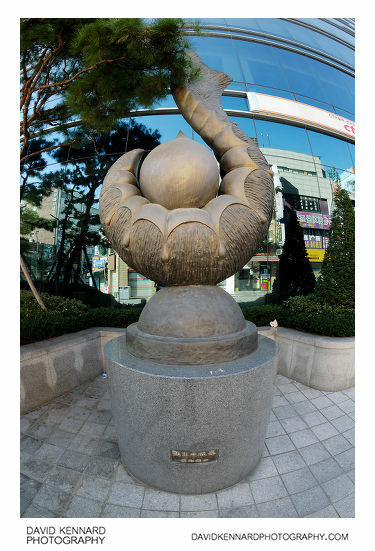 The Korea Times is a Korean Newspaper that is written in English, and used by many Koreans to help them learn English. 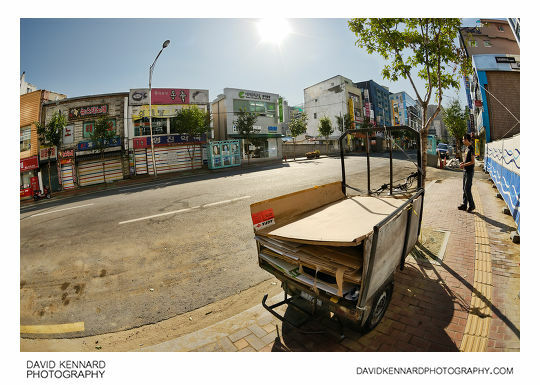 We then turned right down one of the small streets going off from Donhwamun-ro.